Trichomonosis is a disease that infects birds via the protozoan parasite Trichomonas gallinae, and commonly affects birds in the order Columbiformes, such as doves or pigeons. The disease has many effects including inflammation, wounds, and tissue decay in the mouth and throat. Death among infected birds is often due to starvation or a secondary infection, and not necessarily due to Trichomonosis. While the disease is considered uncommon among owls, few studies have fully studied the relationship. A group of scientists including CEID member Richard Hall conducted a study surveying Trichomonosis in owls along the eastern US. Of the 89 owls studied, only six owls from two species were infected with Trichomonosis: two barn owls and four barred owls. They examined the owls’ wounds and took DNA samples to determine if the owls were infected. However, one of the barred owls was only diagnosed based on the lesions, and the diagnosis was not confirmed during molecular testing. 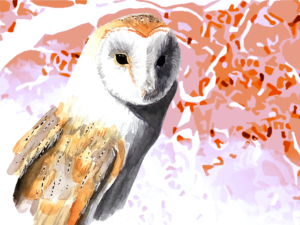 This study found that Trichomonosis can affect at least two species of owls, at different life stages (juveniles and adults). A possible transmission pathway may be through the invasive Eurasian collared-doves which are commonly infected with Trichomonosis. Eurasian collared-dove remains were found in the nesting box of the two barn owls. The Eurasian collared-doves are potential prey for barn owls and other birds such as raptors who might contract Trichomonosis from feeding on infected doves. While transmission occurs via infected food, water and saliva, the doves may be an alternate transmission route which needs further investigation. Future research is also needed on how owls’ diets might change as land-use change increases, to see if there is an increase of feeding on Eurasian collared-doves.